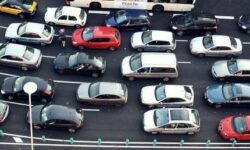 Brexit is already having a noticeable impact on the automotive industry and the commercial relations between the car industries in the European Union and UK. Whatever the final outcome of negotiations, the trade between these two markets will never be the same as a result. It is expected that the exchange of goods will become more difficult, with the ultimate consequence on final prices for consumers. 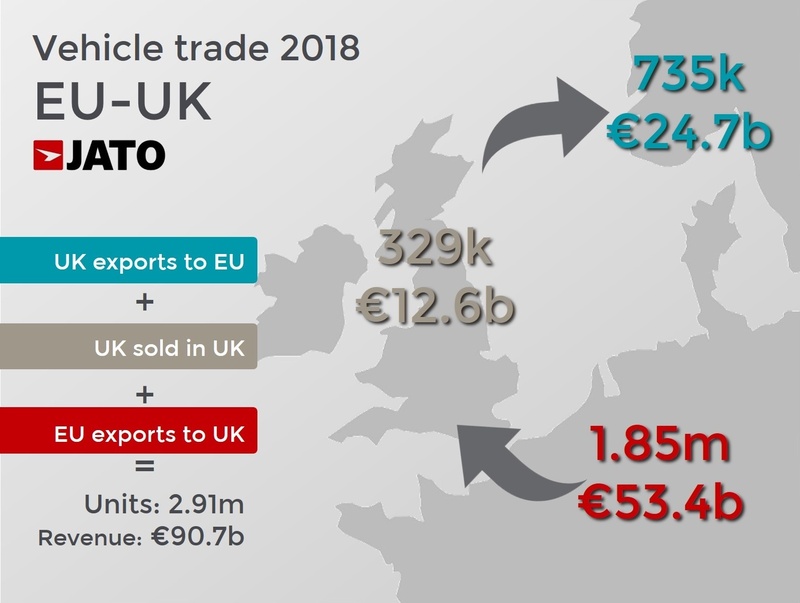 Within this context, our latest data indicates that 17% of the cars and LCVs sold in Europe last year were traded between EU-UK. This includes a total of 2.91 million vehicles (passenger cars and LCV), whether as imports, exports or locally-produced and sold in the UK. The importance of this market makes the outcome of Brexit negotiations even more crucial. We’re talking about the largest EU imports market, the second largest market in Europe by sales volume, and the fifth largest exporter to Europe. As the UK is a market with higher average retail prices than many other European markets, it is a key country in terms of revenue. 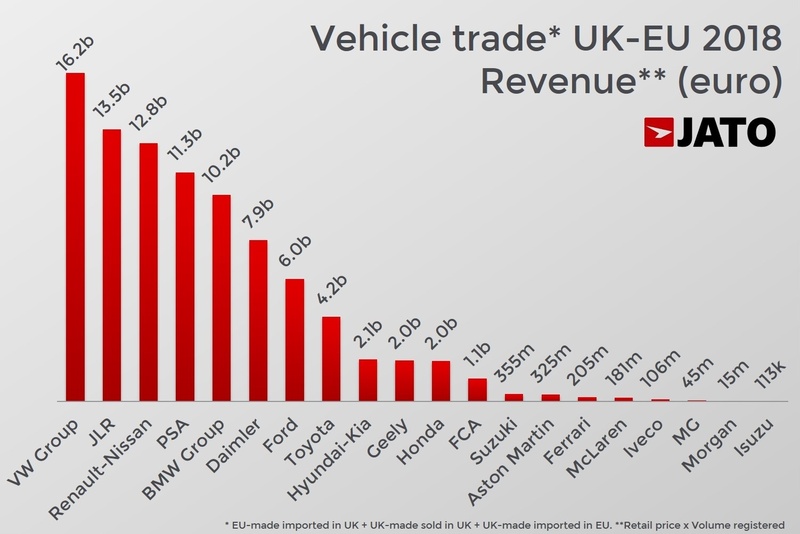 If the volume involved in the UK-EU trade counts for 17%, the combined revenue generated in 2018 from EU imports in the UK, locally-made cars sold in the UK, and UK exports to the EU, totalled almost €91 billion. That is 22% of the total revenue generated in Europe last year. Who in the automotive industry is more exposed to any abrupt change in trade due to Brexit? 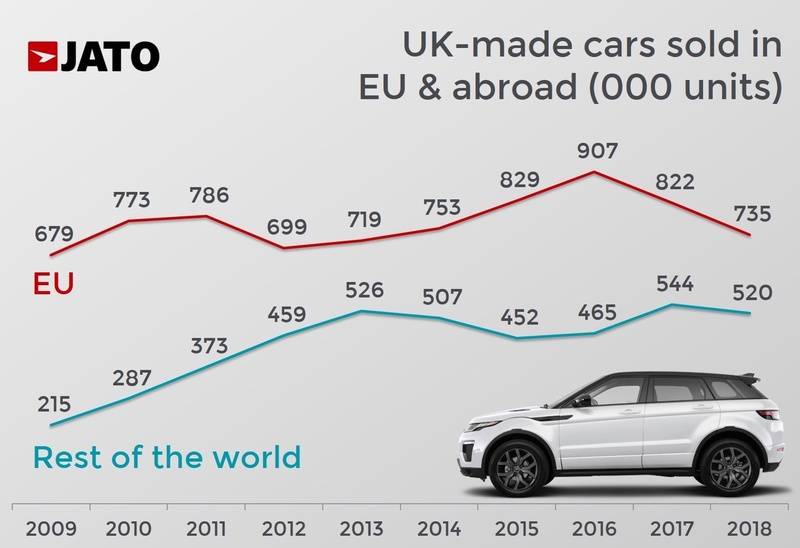 The UK car market is not only the homeland of several British brands, but it is also a key market for some foreign makers that produce locally. Moreover, it has become one of the largest markets for German premiums and Volkswagen. 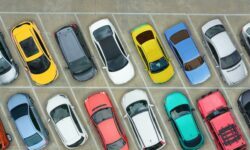 Last year, the UK was the second biggest market for PSA, third for Ford, and the fourth for VW Group, Daimler, BMW Group, Geely Group and Tata Group. It was also the world’s fourth largest SUV market, an important driver of growth and profitability. 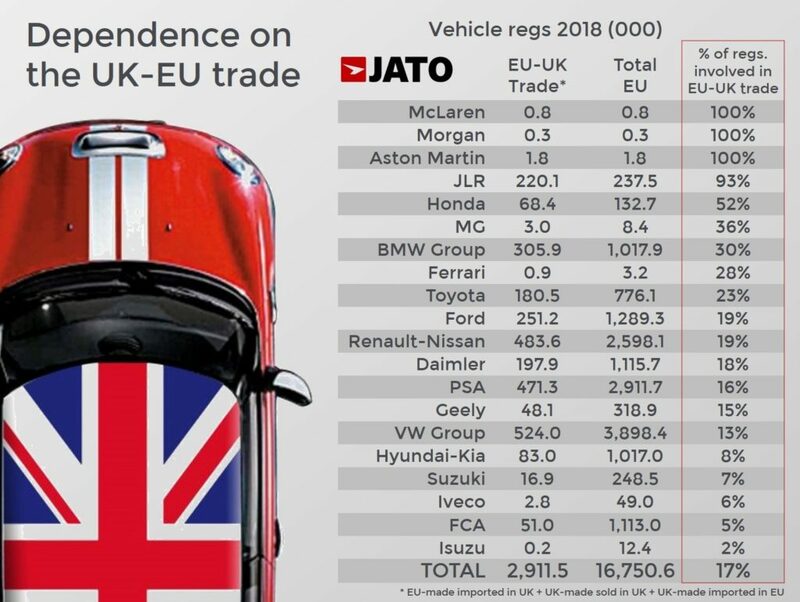 Our data for Europe (23 markets of EU+EFTA) shows that Jaguar Land Rover and Honda recorded the highest dependence on UK-EU trade in terms of exports, imports and local sales. 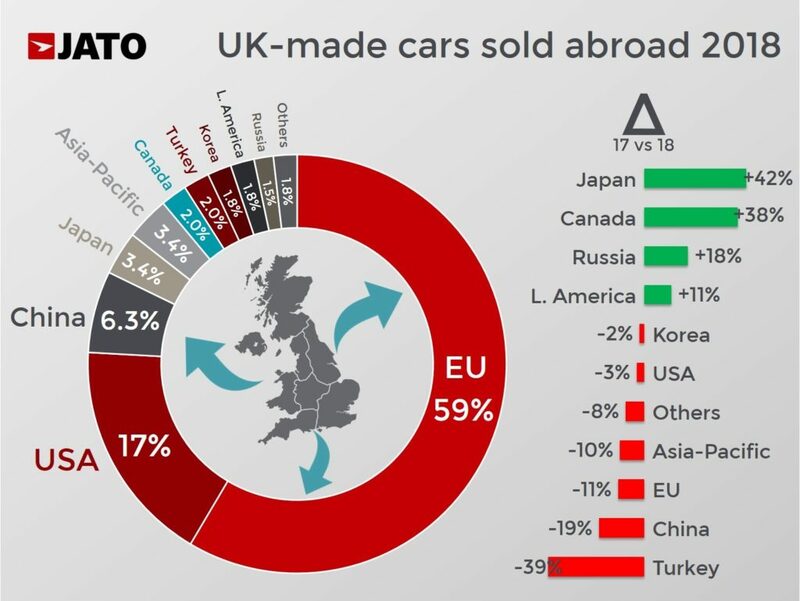 For the former, the exposure is quite high, as 220,000 of the 237,500 vehicles it sold in Europe in 2018 were within UK-EU trade. Jaguar Land Rover sold 105,000 UK-built vehicles in the UK and exported 104,000 vehicles from its UK plants to the EU. It imported 11,300 units from the EU to the UK. 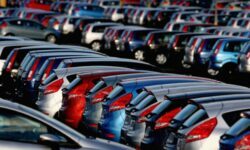 In 2018 Honda sold 132,700 vehicles in Europe-23. As it runs only one plant in Europe, in Swindon, it did not import any cars from the EU to the UK. 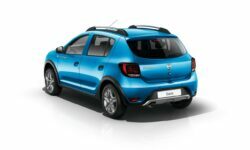 However, its UK plant sold 68,400 units in the UK and the EU combined. This can partially explain the recent decision made by the brand to shut down its Swindon plant. The UK is also a key market for the European operations of BMW Group, due to the big presence of its BMW and Mini brands. Some of the latter’s products are locally produced, counting for 15% of the total sales in UK-EU trade. The imports from Europe to the UK counted for 56%, and the exports from the UK to Europe counted for 29%. That’s 306,000 units, or 30% of the group’s total sales in Europe. Our figures by revenue (retail price x units sold in 2018) suggest that there are also some other important players to consider in these challenging times. As expected, VW Group posted the highest revenue from exports, imports and locally-built car sales. The Germans recorded a total revenue of €16.2 billion from the trade between the UK and EU – 18% of total exchange revenue. The fact that JLR is in second place in the revenue tables confirms how strongly it is exposed to the Brexit issue. While this can be partially explained by the brand’s expensive cars, it is also true that volume plays a role. The rest of the rankings are occupied by the big mainstream and premium automakers, but it’s interesting to see key automakers like Ford, Toyota and Hyundai lower down the revenue rankings.